Weekly Standard: Leaker-In-Chief Recent intelligence leaks from the Obama administration have inspired discontent on both sides of the aisle. Lee Smith of The Weekly Standard argues the information was released to bolster Obama's re-election chances. 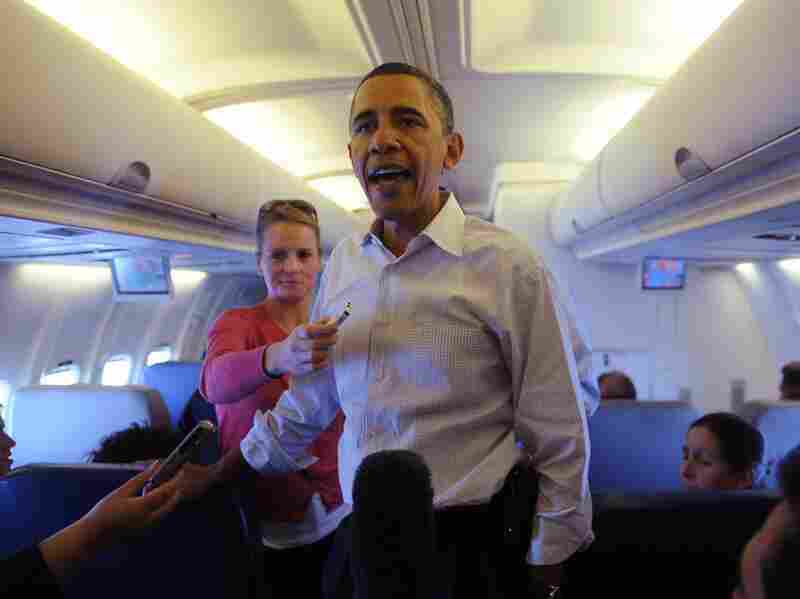 President Barack Obama speaks with traveling journalists on board Air Force One on April 28, 2010. His administration faces criticism for a spate of recent intelligence leaks. Lee Smith is a senior editor at The Weekly Standard. The Justice Department has launched an investigation into the White House's handling of classified information. The spur seems to have been the June 1 New York Times article by David Sanger, sourced to current and former U.S. officials, revealing sensitive details about the Stuxnet and Flame computer worms and other parts of the Obama administration's cyber campaign to disrupt and spy on Iran's nuclear weapons program. By the way, none of the officials, according to Sanger, "would allow their names to be used because the effort remains highly classified, and parts of it continue to this day." Last week, legislators on both sides of the aisle deplored the administration's inability, or unwillingness, to keep national security secrets. Leaders of the Senate and House intelligence committees — Sens. Saxby Chambliss and Dianne Feinstein and Reps. Mike Rogers and C.A. Dutch Ruppersberger — released a statement noting, "We have become increasingly concerned at the continued leaks regarding sensitive intelligence programs and activities, including specific details of sources and methods." In his June 8 press conference Obama tried to push back against the gathering storm. "The notion that my White House would purposely release classified national security information is offensive," he said. "It's wrong." The president and the New York Times can't both be right. If the president is correct, then the paper of record, which has so far seemed to be a willing receptacle for the administration's leaks, must be printing fabrications. Last month the same newspaper detailed how the president directs U.S. drone attacks in Pakistan and Yemen based on a classified "kill list" of terror suspects, a story based on information from "three dozen" of the president's "current and former advisers." So the latest Times article on Iran, revealing what the administration has now tacitly acknowledged as a joint U.S.-Israeli program, looks to be merely the most recent installment in a campaign of intentional leaks damaging to our national security. The administration, needless to say, sees things differently. From the perspective of Obama's handlers, and perhaps of their friends in the press, these leaks are spellbinding episodes in a Hollywood-worthy narrative of the president as ever-vigilant superhero, with his finger on the button, ready at a moment's notice to bring the full weight of American power to bear on our adversaries, so that we may all sleep safely at night. It's epic, all right. But it's spin. All White Houses engage in political stagecraft, but this is something else. The Obama administration can rightly claim the crown of laurels for killing Osama bin Laden — even if the program and personnel that brought down the al-Qaida chief were in place long before Obama came to office. But due credit was not enough for the Obama team. To craft a story about a heroic president and his leading part in American history, the administration rolled out the red carpet for moviemakers like Hurt Locker director Kathryn Bigelow, and gorged the working press with details. It was this information that disclosed the role of a local doctor whose efforts on behalf of an American clandestine operation earned him a 33-year sentence in a Pakistani prison. That physician is not the only casualty of the White House's vanity. The administration boasted of a mole who had infiltrated al-Qaida in the Arabian Peninsula and helped thwart an attack against the United States. The man was working for British and Saudi intelligence and details of his role not only damaged the ongoing operations of allied intelligence services, but also put the lives of the agent and others at risk. Who knows how the information disclosed in the Times's recent Stuxnet story may come back to harm our citizens and interests, or our ally Israel's? But the message broadcast to friends, and potential friends, is clear enough. If you fail in your dangerous mission, you may die. If you succeed, you may earn a supporting role in the Obama reelection campaign. "Why else would they want to do this, except to enhance the image of the president six months before the election?" Sen. John McCain said in an interview with The Weekly Standard last week. "Why else reveal the name of this Pakistani doctor? You can only draw one conclusion. The purpose of all these leaks is to tell a story about a brave, lonely warrior with all this awesome responsibility." McCain, who has called for a special prosecutor, has been the administration's most vocal critic. The White House, says McCain, "got mad when I said these leaks were all meant to make the president look good." But that's the simplest explanation for the leaks: The White House has run an information operation that has put us and our allies at risk with no obvious benefit except to the prospects of Obama's reelection. McCain says he is cheered by the "widespread bipartisan anger at the leaks," but Feinstein and other Democrats, such as John Kerry, say that the leaks are just a function of lax discipline and the administration's poor housekeeping. However, there is evidence that the White House knows quite well what it's doing. In an excerpt from his just published book, Confront and Conceal: Obama's Secret Wars and Surprising Use of American Power, from which the cyber war story was adapted for the Times, Sanger recounts how Pentagon officials "fumed" when White House counterterrorism czar John Brennan apparently gave away "operational secrets never shared outside the tribe." Defense Secretary Robert Gates confronted the senior administration official he perhaps believed in the best position to enact, or at least forward, his recommendation for a "new strategic communications approach." And what was that strategic approach? asked White House National Security Adviser Thomas Donilon. "Shut the f — up," said Gates. In other words, Defense Secretary Robert Gates thought President Obama's national security adviser was responsible, directly or indirectly, for the leaks. And if Donilon is responsible, the buck stops with President Obama. To paraphrase the president, that his White House would purposely release classified national security information is offensive. And it's wrong.